Unfortunately I’ve had a serious computer crash last week, so I haven’t found the time to produce an episode. This is the reason why I’m presenting my favorite tracks of this month just as a list of mp3’s, you can listen to them all by clicking the link above or through the player below (of course the mp3-links in the list are also playable, so you can listen to them track-by-track too). 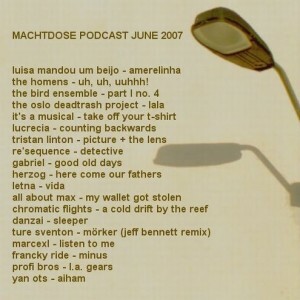 Just a few words: I’ve started with the excellent Luisa Mandou Um Beijo from Brasil – a band often associated with Belle & Sebastian, it reminds me also to Chumbawamba and Stereolab. If you follow the link to the netlabel site you will get an excellent album which is in heavy rotation here! I took notice of them through the fabulous compilation Share It Spread It Love It – Vol. 1 by open culture site Metawelle. The second track by the Homens, a nice Sixties-sounding-flick, is directly taken from it. Also an interesting compilation series is made by Silent Ballet with a focus on post-rock, so is third track by the Bird Ensemble. We then have a pop section: The Oslo Deadtrash Project has released a three-track ep on Tripostal, which is the netlabel site of the Belgian independent label Carte Postal, „It’s a musical“ is the new supergroup of everybody’s darling Bobby Baby and Robot (Lady Boy). Don’t miss their first concert on July 3rd at Hotel Bar, Berlin! Next one is Lucrecia, also a lovely album on Series Media, second time appearance of this netlabel here at Machtdose after we’ve already played a track of them last month. The Sound effect of this month: „Children playing on a backyard“ – you have some kind of it in all of the following three tracks by Gabriel, herzog and Letna – they form the more relaxing part of the tracklist, also the next ones by All about Max, (again: excellent ep!) and Chromatic Flights. At the end – as always – the more „classic netlabel genre“ which means minimal / technoid sounding tracks: Danzai, Ture Sventon, Marcexl and Francky Ride, then the Profi Bros doin‘ it à la Daft Punk. The list is closed by the tribal house of Yan Ots (celebrating the first anniversary of netlabel diggirama.com). That’s it! Sorry for the missing moderation this month. (I’m not sure what it means for the Podcast subscribers to get only a M3U list – maybe you can give me a short feedback- Hey, I like feedback in general!). vielen Dank für eurere monatliche Selektion! Exquisit! Besonderen Dank für die „Lala“-Ausgrabung.